Picture it: Someone sneaks onto your lot in the dead of night with nefarious deeds in mind. Maybe it’s kids with a baseball bat and some spray paint out for a “good time” and some property damage. Maybe it’s a disgruntled former employee who knows that the security system is out of date and there aren’t a lot of security cameras keeping an eye on the place. Maybe it’s a professional car thief with an eye for equipment that can easily be resold and a shiny new car to get away in. If you can imagine it, chances are it’s happening in Kansas City and all around the country, and the car dealer security on many lots may not currently be up to the challenge. According to data from the U.S. Department of Justice and the Federal Bureau of Investigation, there are around three-quarters of a million motor vehicles stolen in the United States every year, with dollar losses totaling more than $6 billion. Many of those are stolen off the street, from parking lots, and even from driveways, but some are service vehicles and even inventory vehicles stolen from car lots. What’s more, the number of vehicle thefts is on the rise after years of decline. With so many tempting targets for would-be auto thieves to choose from, car dealerships may suffer the brunt of this rising trend in motor vehicle thefts. According to the National Insurance Crime Bureau, the most popular targets among car dealerships by manufacturer are Honda, Nissan, Toyota, Dodge, Ford, Hyundai, and GMC. That’s a lot of cars to keep an eye on, and it isn’t just four-wheeled vehicles that draw out the crooks. Honda, Yamaha, Suzuki, Kawasaki, and Harley-Davidson motorcycles are also hot targets for thieves. 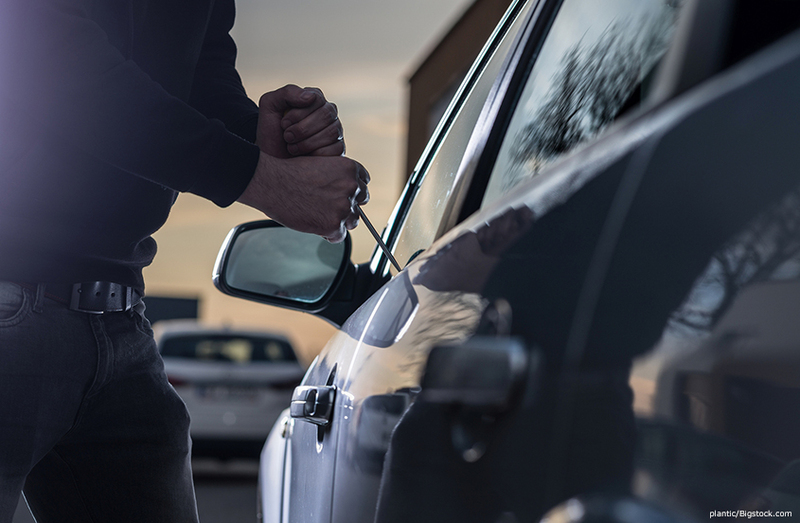 That all sounds like bad news for car dealer security in Kansas City, and it is, but here’s the good news: Kansas City isn’t among the top 10 states or greater metro areas when it comes to vehicle theft. However, just because there are places where auto theft is a bigger problem doesn’t mean that Kansas City auto dealers don’t need to take steps to stem the rising tide of vehicle thefts. Car dealers aren’t the only businesses who need to be concerned about an increase in vehicle thefts, either. Companies that provide services such as plumbing, carpentry, and electrical work, to name a few, are turning to commercial security in Kansas City to help counter a growing trend in service vehicle thefts. Many times, when car thieves steal a vehicle, the car is what they’re after. But in the case of service vehicle thefts, the target may just as easily be what’s inside the vehicle. Anything from tools and equipment to radios, phones, or valuable metals such as copper or platinum that might be inside electronic devices can be resold by thieves. While it may be impossible to deter all crimes, better securing your Kansas City auto dealership isn’t an impossible feat. With commercial security systems and security cameras in Kansas City, you can increase security on your lot—or help safeguard your service business. Of course, no auto dealer security is ever going to be 100% foolproof, but with the right setup, even in the unfortunate event that something untoward does happen, you’re more likely to have captured solid evidence of the crime that can be used for law enforcement, insurance, and internal needs. Unfortunately, employee theft is a real problem that is faced by businesses of all kinds, including car dealerships. That’s why auto dealer security can help deter not only theft from outside sources but also internal theft, while also helping you to keep an eye on unknown visitors to your lot and safeguard your business in a tech-savvy way. Because car lots are usually well-lit, even after business hours, your odds of capturing high-quality video images of those entering or leaving your lot are good, so long as you have security cameras that are high enough resolution to make out fine details such as facial recognition or license plates. For service vehicles that may be stored in back lots that are not as well lighted, you might need night vision security cameras in Kansas City. Whatever you’re doing to secure your business, you have a lot of options when it comes to car dealer security in Kansas City, with everything from gates and beams to security systems and, of course, security cameras hooked to a network video recorder at your fingertips. Security cameras are a vital part of just about any commercial security system, but they are particularly useful for car dealer security, especially when they’re properly positioned and deployed. Unfortunately, those who choose to install their own security cameras in Kansas City often fall victim to “rookie mistakes,” including placing cameras in areas of inadequate lighting, setting up cameras at the wrong angle, or using commercial security cameras that simply aren’t up to the task at hand. Getting the most out of your security system involves getting the right cameras for the job and putting them in the right place. Part of that is elevation. Cameras that are placed too high up are less likely to recognize license plates or facial features, but cameras that hang too low can be easily dismantled or tampered with, as seen in pretty much every heist movie ever. It’s also important to remember that security cameras in Kansas City are just one part of your car dealer security “ecosystem.” Cameras are a vital component, but they work best when they’re combined with a range of other commercial security solutions, including fences and gates, motion-sensor security lights, and a properly installed and monitored commercial security system. According to the FBI, a motor vehicle is stolen every 44 seconds in the United States alone. These thieves aren’t kids out for a joyride; they are often professionals operating as part of a sophisticated network. With the right auto dealer security solutions, you can help make sure that stolen car isn’t one of yours. A-TEC Commercial Security in Kansas City helps businesses of every kind protect what’s most valuable to them, from vehicles and inventory to premises, customers, and employees. To learn more about commercial security cameras and other car dealer security options, contact A-TEC Security today.